The Panasonic LUMIX G Vario 14-140mm Lens (35mm equivalent focal length: 28-280mm) is a 10x optical, metal bodied zoom lens and is designed specifically for the Panasonic LUMIX G mirrorless cameras and Micro Four Thirds standard. The lens incorporates Panasonic’s POWER O.I.S. optical image stabiliser, which includes a lens shift system enabling stable framing even in a telephoto position. 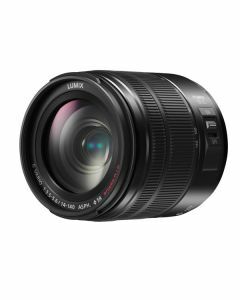 The lens range includes the premium lens brand, ‘X’ for LUMIX G ultra-compact electronic power zoom lenses which utilise the best in advanced optical performance. The 14-140mm lens is the ideal lens for general purpose photography, such as landscapes, portraits, sports, wildlife and travel. The 14-140mm lens offers an extremely wide and versatile focal range to ensure you have the right set-up to capture every moment. What’s more, it is smaller in size, lighter in weight and offers a bigger f/3.5-5.6 aperture.